Health Insurance Premiums for individual policyholders will be increasing substantially in 2017. 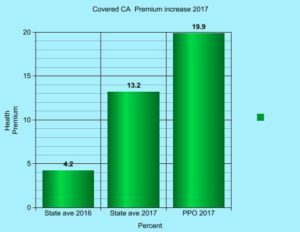 Covered California announced a state-wide average increase of 13.2 %, while PPO carriers Anthem and Blue Shield reported increases of 19.9% and higher. In contrast to Southern Calififornia, Northern California has particularly less competition due to fewer hospitals and large integrated hospital systems, will experience 30% higher premiums. During a press conference on July 19th, 2016, Covered California advised Californians that “the annual 3-year average increase of 7% is lower than pre-Affordable Care Act trends”. However, many middle class families who earn more than 400% of the Federal Poverty Level who do not qualify for subsidies, have not experienced a comparable 21 % income increase, over the last 3 years. In particular, families and policy holders in their 50’s and 60’s will be hurt acutely by the 2017 health insurance premium increases. However, Californians who receive subsidies might not feel the effects of the increases as much, as the subsidy level will be increased, accordingly. Covered CA and the insurance carriers explain 2 major reasons for the necessary premium increases. 1) Miscalculations of 2016 rates: The insurance carriers stated that they underestimated the member utilization, especially the prescription drug utilization in 2016. As they had to calculate the rate in April of 2015 for that of 2016, they did not have data on the significant increase of utilization of health care services in 2015 in comparison to 2014. Last year’s average state increase was a 4.2%. 2) Removal of ACA Reinsurance: The “reinsurance program that had provided funds to health plans with higher cost enrollees to offset those medical cost and guarantee coverage regardless of health status” ended in 2016; that alone added a 4.6% increase to the 2017 rates. In comparison to 2016, Covered CA will introduce for 2017 some significant positive changes to the benefits on some of their metal plans. 1) With the exception of the Bronze plans, ER Visits will have a flat co-pay instead of going into the deductible; on the Silver plans it will be $350, Gold $325, and Platinum $150. Bronze policyholder ER visits remain subject to the deductible. 2) For Silver Plans – the cost to visit a Primary doctor will be lowered from $45 to $35 with the expectation that more policyholders will use their primary doctor as the gate-keeper to oversee and organize their member’s heath. Even PPO policyholders are asked, in the first 60 days, to pick a primary care doctor to “establish a source of care, who will help to navigate the health care system for the patient”. However, a PPO policyholder can still go to the doctor of their choice, with specialist visits for Silver at $70; Gold at $55. 3) Urgent Care Visits will have a significantly lower copay of $35 (in 2016 copay was $90 on Silver). 5) More carriers will offer online service to talk to a doctor online or via smart phone, whereby they can help the consumer by directing him or her to the right provider, or even prescribe a prescription online. 7) The deductible for the Silver plans will be $2500 per individual (a $250 increase) and $6300 for Bronze (a $300 increase). The out-of pocket maximum is increasing to $500 for the individual for Silver and Bronze to a steep $6800; Gold, $6750; and Platinum remains $4000. – So, it makes sense to buy a low-price accident and critical-illness plan to off-set the steep out-of- pocket maximum, should the unexpected happen. 1) All Policyholders, even PPO holders, have to elect in the first 60 days a primary care doctor who will facilitate and help coordinate a patient’s need of care. The primary care doctor will help guide the patient through the health care system. PPO policyholders can still see the doctor they want. Only Blue Shield is offering statewide a PPO, and is introducing in most counties, now, an HMO as well. Anthem offers HMO’s. Only In 5 Northern counties Anthem will offer PPO offerings . In regions such as Los Angeles, San Francisco and 12 more regions they are going back to the EPO system in the Covered California exchange.Remember with an EPO, you can go to any doctor inside the network; however, no services will be paid outside the provider network. 2) “New Models of care coordination across specialties will be implemented, including integrated “health care models or accountable care organizations”. 3) Plans will work with hospitals and physicians so that physicians will be notified if a patient is in a hospital. 4) Health Plan will improve their tools for policyholders to view provider-specific cost shares (based on contracted rates and quality information for inpatient, outpatient, ambulatory services and prescription drugs). Policyholders will more easily see the plan-specific accumulations toward deductibles and out-of- pocket maximums. Throughout California and especially in Los Angeles, San Francisco and Riverside, policy holders have to rethink the question whether or not they really want to access the high quality hospitals such as Cedar Sinai, UCLA, Hoag or Eisenhower Medical Plaza, or Stanford, just to mention a few. If the answer is “yes”, then policyholders have only the choices of Anthem, Blue Shield and partly Oscar – and, yes, have to accept the steep increases of approx 20 percent. Futhermore, policy holders have to ask themselves if they have the risk-tolerance of a $6300 deductible with the Bronze plans – for many 55-year and older policyholders, sometimes this is the only solution left, if they do not qualify for subsidies. In my opinion Kaiser, whose rates are pretty close to Oscar and show a moderate increase of 5%, will enroll more Californians in 2017. Kaiser opened a new facility in Santa Monica, and is expanding in the Northern region, Monterey and Santa Cruz, and has overall a good reputation. For the policyholder who is most price conscious and indifferent to the reputation of the hospitals and choices of doctors, Molina Care, LA Care and HealthNet HMOs might be valid choices; Molina Care, with a 7% premium increase, will still be the cheapest healthcare carrier in 2017. Remember, we currently have only the preliminary rates for Covered CA inside the exchange, and the rates for each individual health carrier will not be published until October. So, we have to wait and see, and hope that the major health carriers show some interesting health plan alternatives outside the exchange. For those policyholders who receive subsidies, the amount of financial assistance available to consumers will increase for most regions, which will partially offset the steep increases – and, if not, in your case, you might have to switch health carriers. My suggestion is to review your modified adjusted gross income of 2015, and see how your income from 2015 to 2016 has changed. This way, you can predict more accurately your income of 2017, as we need to adjust this number in order to accurately calculate your premium assistance for 2017. In the next couple of months, please make sure to read the letters that Covered CA sends you, and make sure to either contact your agent or Covered CA to make any adjustments pertaining family size, address, change of income, marital status etc., and agreement to review your tax returns. Solid Health Insurance Services is here to update you with the newest information for health insurance choices for 2017. Our mission is to find affordable health insurance which fits your individual , family and business needs.